Hello and welcome to the personal blog of Darren Scott. I'm a professional software engineer working for a tier-1 investment bank in London, specialising in graphical user interface design and implementation mainly using Java Swing. Here I'll post stuff about topics that interest me such as technology, software development, aviation, driving & motorcycling, radio controlled helicopters and photography. Hopefully you'll find something interesting here - thanks for visiting. 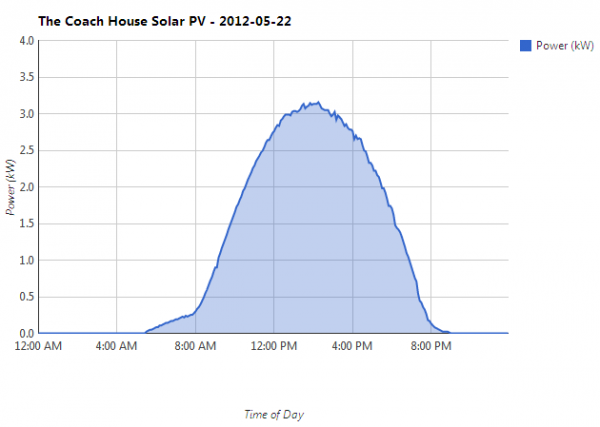 Today our solar PV installation generated 25.07kWh of electricity, a new record beating the previous high of 21.69kWh. As you can see there was unbroken sunshine all day although it only peaked up to around 3.1kW which reduced the overall output for the day. We’ve seen the system peak at over 4kW so I hope as we get later into the year we will see higher daily totals due to the higher peak output. ← Previous Post A pair of Raspberry Pis!